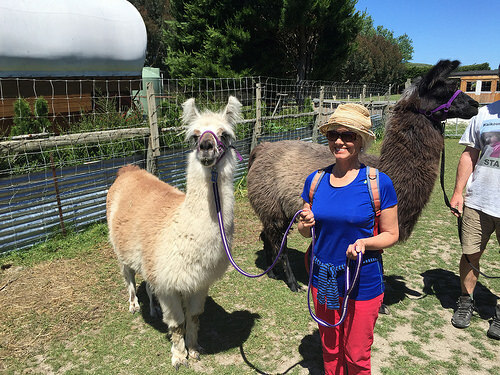 We chose the one-hour ‘teaser’ to learn about what Llama Trekking was all about. First of all, you need to be a true animal lover. And most people will love the close interaction with these doe-eyed lovelies. We were very curious as to what makes Llamas ‘tick’. They’re actually very intelligent creatures and they never forget! Also included on the half-day trek is a stroll the beautiful coastal walkways and a visit to a restored Whaler’s cottage and museum. And there really is no more effective way of getting rural views and views of the beautiful Kaikoura mountain range. 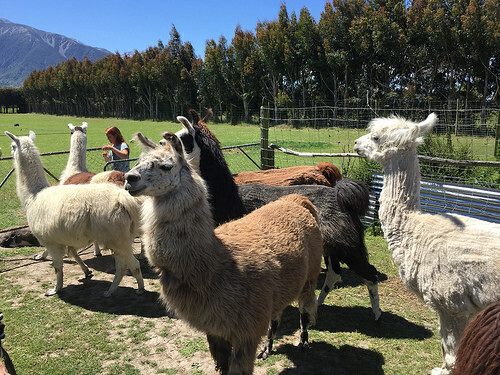 Everyone is allotted their very own Llama (actually the Llamas do the choosing) and then you’re invited to walk along beside them holding onto their lead. The load that Llamas are permitted to carry, is a small saddle bags. These bags contain a picnic lunch and homemade treats for the tour. 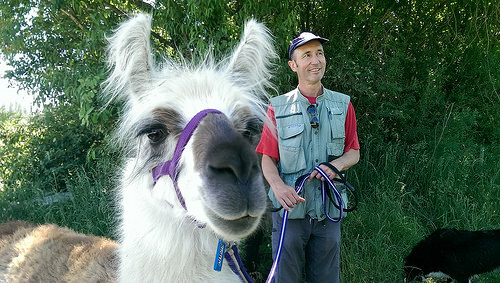 Here’s one happy customer bonding with their Llama. With the half day trek, you’ll be collected from the Kaikoura I-site carpark. The carpark is centrally located in the Kaikoura township. 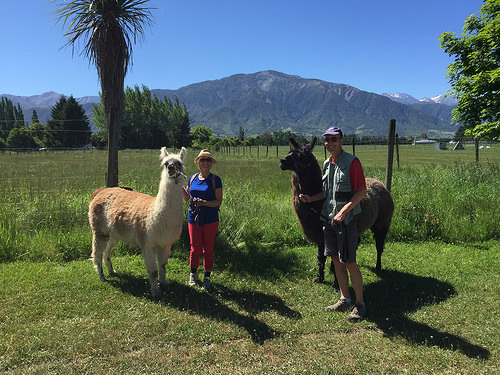 Families with older children will love this tour and you’ll be well looked after by Kevin and Lynn who are passionate about Llamas. oh my gosh they are adorable. I had a great experience when I first moved to the West Coast – with my dog Jeddyboy. 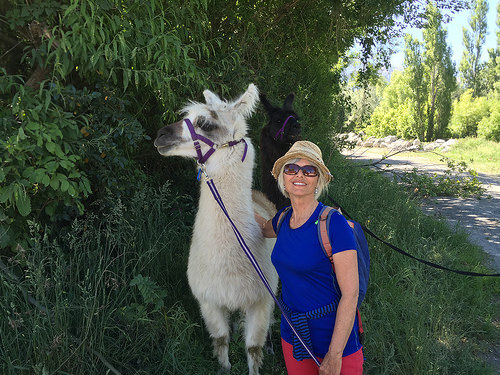 We headed off to explore a local walk but had to go through a paddock to reach the official start of the trail….. we were greeted by a grumpy horse and an even grumpier Llama. They both hissed and spat at us – Jeddyboy was hiding behind me, more frightened of them then they were of us. I eventually shooed them away – and we got our walk in. It still makes me laugh thinking about it. I love that first photo Pam – Michael and his mate – gorgeous! Thankfully, we weren’t hissed at. That must have been a frightening experience at the time. Apparently, there is a hierarchy in the Llama Kingdom. Michael’s Llama, Legend, had a bit of a nip at Sylvester, who by all accounts was his best friend. They definitely need a strong hand but love the rewards as well. I won Brownie points by occasionally letting him eat the rich grass along the way. I was a bit too soft though and he sensed it. 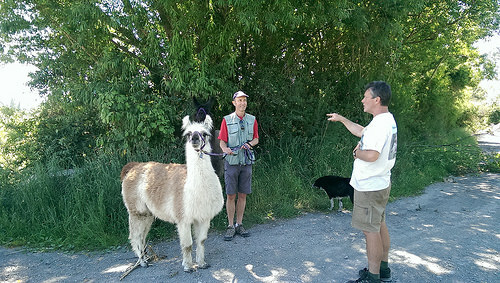 Both Llamas loved Michael and looked upon me as a bit of a clown. Yes, it was only after I published that photo that I could see that the proportions..um..weren’t quite to scale. Both Llamas constantly battered their long eyelashes at us and were such flirts.